Pewdiepie is in no mood to give up. The YouTube war is on. While it is pretty much a one-sided beef, the world's most subscribed YouTuber Felix Arvid Ulf Kjellberg aka Pewdiepie is leaving no stones unturned to take digs at the #2 YouTube channel - T-Series. T-Series, an Indian music record label and film production company, founded by Gulshan Kumar in the 1980s, is inching closer to claiming the #1 position on YouTube and this development has got the entire Internet talking. Including YouTube king Pewds. While the Swedish content creator is backed by 66,802,893 subs, T-Series, on the other hand, is just a hair behind with 65,097,974 subs. Sensing the end is near, Pewdiepie recently dropped a diss track roasting T-Series and the YouTube community couldn't have asked for more. Dropped on 5th October, the diss track has raked 7.5 million views with a million likes. 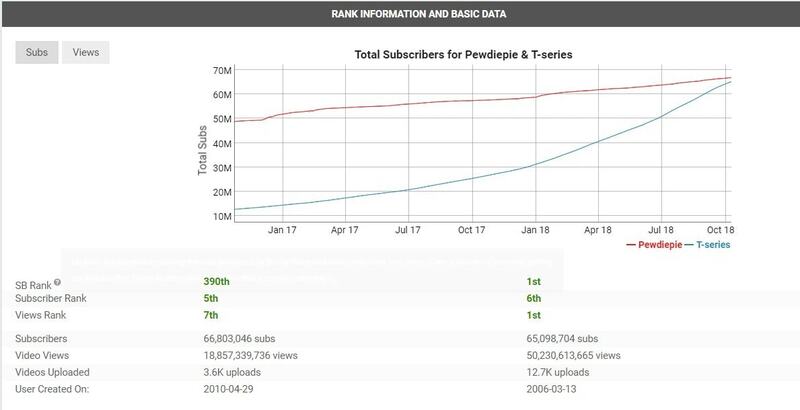 When the subscriber war first came to light two months ago, T-Series was behind by as many as 6 million followers. The difference right now is less than 2 million. However, several users on the Internet believe that there's no comparison between the two channels. While the Swedish gamer is an independent creator, T-Series is a full-fledged music production company. YouTube’s search and recommendation algorithm also benefits musical artists more than independent YouTube creators. T-Series joined YouTube in 2006 and has released 12,699 videos since. Pewdiepie, who joined the platform in 2010, has 3622 videos to his name.